A writing prompt and the first signs of autumn inspired me to give you all a little early Halloween present. Branches grab at her legs as Tina sprints down the little-used trail. The thick forest suspends the trail in inky darkness, despite the October night’s full moon. Tripping over a gnarled root, she falls flat, scraping the palms of her hands on the rough forest floor. The sounds of pursuit gain ground: crackling leaves, snapping branches, and howls of rage. Struggling to her feet, Tina knows that she has to do something to stop the creature that chases her. Though she hesitates to use force, the time has come to either fight back or lie down and die. Turning off of the old deer trail, she hurries to a nearby clearing. Tina doesn’t bother to hide the sounds of her route. She wants the animal to find her now. As if on cue, the beast howls in excitement, and the sounds of its passage veer off the path to follow her. Rushing through the clearing, Tina turns back towards the sound of pursuit and drops to her knees. She presses her stinging palms to the dry grass and begins a chant that has been often practiced but never before used. The ground before her changes, rippling in the moonlight, then settles back to stillness. Charging out of the trees, the animal is before her. It howls and gibbers as it catches sight of its prey. Tina stands and regards it coolly. As the beast strides across the small clearing, its feet begin to sink into the ground. Before it is halfway to her, it sinks to the waist into the quicksand she conjured. “I think not,” Tina says softly. “You will burn in hell!” He snarls right before the ground swallows him. “I think not,” she repeats, before turning weary feet toward home. 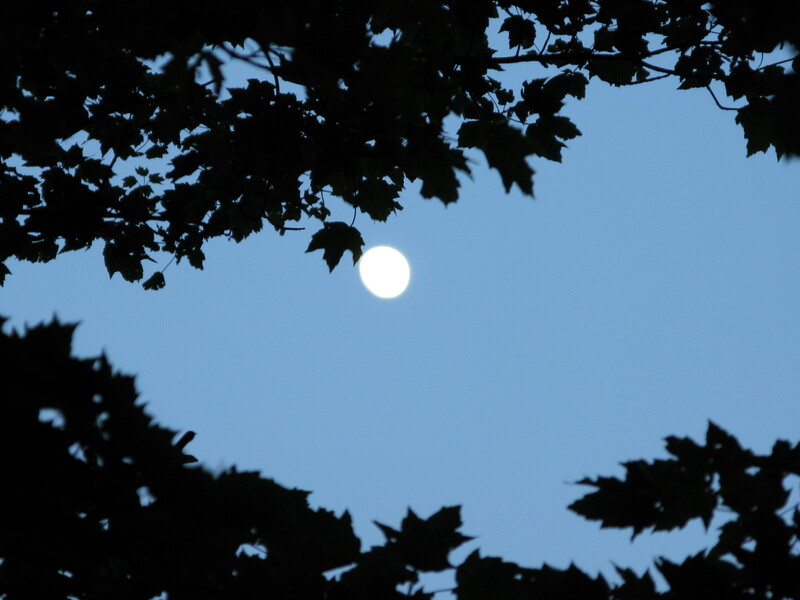 Moon through the trees, Smoky Mountain National Park. I’m entering this flash fiction piece over at the Trifecta challenge page. The link is here if you want to go read cool stories and vote on your favorite. There’s also still time for my fellow writers to enter your own piece! Rules and guidelines are posted on the page I linked. Go, see, explore! This entry was posted in Short Stories, Trifecta writing challenge, writing, Writing challenge and tagged DPchallenge, short story, The Animal, Trifecta writing challenge, writing. Bookmark the permalink. Nice twist as others have said. A gripping read! Great buildup – I was sure we were reading another serial killer story until she put her hands on the ground. What a fun surprise! I’m glad she had time to speak the spell. Oh, and I loved how she repeated “I think not.” That was perfect. I like a little twist now and again. Glad that you enjoyed it! That’s what I was going for! Thanks! Really what did he think would happen if he decided to chase a witch. I loved the repetition of her saying, “I think not.” Also the accompanying photo is perfect! I took that picture on a fishing trip, and it sure came in handy for this story. Thanks! Oops, not that it matters, but it wasn’t fishing it was hiking in the Smokies! I’m thinking differences of opinion. Thanks! Definitely wasn’t expecting a boyfriend, or a witch’s spell… Fun read. Loved the descriptions of the chase and the twist. We are going to need part two if boyfriend finds his way back… Thanks for linking up and don’t forget to come back and vote! Thanks! I won’t forget to vote, I’ve been reading all the stories, and having a great time! Whoa…boyfriend…wasn’t expecting that 🙂 I like the image of the ground rippling and then returning to normal. This is intriguing. Different layers, so much to wonder about. And surprises too!